On Day 5 of the Atkins plan, I finally realized the importance of having readily available low carb snacks on hand at all times. Without grains, rice, pasta, or bread to fill up on, three meals a day is just not enough. And when you get hungry again it’s like falling off a cliff in a primal “REALLY-HUNGRY-AND-NEED-TO PUT-FOOD-IN-MOUTH NOW” way. All week I was unprepared for this, and fell off the no-carb snack wagon twice. Determined not to fall again, we have begun keeping cold meats and cheese around. It would be easy to buy cold cuts, but I simply don’t like the idea of consuming so many nitrates on a daily basis. So instead, I just cook extra meat or protein the night before. Last night, inspired by a dish I had on my birthday at Eleven Madison Park, I made Cumin & Coriander Duck Breast, plus an extra one for next day snacking. I rubbed the duck breasts with salt, pepper, crushed coriander and cumin seed, and a pinch of five-spice. Rendering the skin in a skillet really slowly made it really crispy while toasting the spices and bringing out their aroma. Cooked to medium, the duck breasts stayed pink and tender for the next day. Today, D and I had a late brunch, then a busy afternoon of running errands. By 4 pm, with no low-carb snack options en route, and dinner still hours away we were getting pretty cranky. A little cold sliced duck, sharp cheddar cheese, sheeps milk gouda, and cornichons were the perfect foil. The coriander added a citrusy herbal flavor, the cumin an earthy smokiness, and the five spice was sweet and aromatic with anise, cinnamon, and clove. 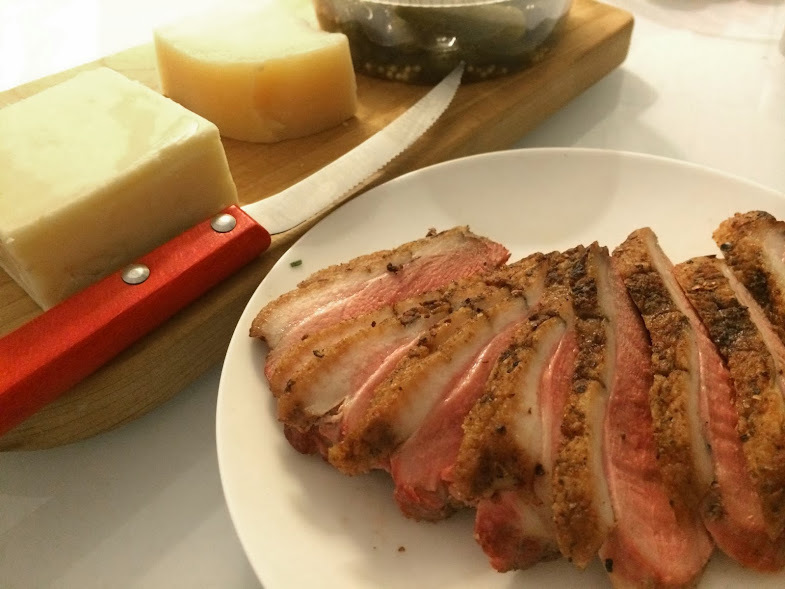 Tags: Atkins, Charcuterie, Duck, Low Carb, Snacks, Technique. Bookmark the permalink. And sooooo easy. Try it and let me know how it goes!